First a bit of old news. Here are my clover blocks pieced and ready to back and bind. I’m going to use a scrappy green binding. I was thinking about doing a scrappy green border, but when I had it on the design wall, it seemed to detract from the clover too much. I really love this quilt. I’d never set anything on point before so it was a bit of a challenge for me. I have a few clover left over that I plan to turn into a spring wallhanging. Thank you everyone who helped make this beautiful quilt top. And for a bit of new….here are some curved rail blocks for this month. I love batiks and have three more put aside that hopefully I will have time to sew…but for now…here are 6 blocks for me. And also….my violets are packed and ready to go to the post office in the morning to start their trip way down south. Lately I've noticed that I want to put everything on point. I love the scrappy pieced cream and green sashing–everyone should be sure to click and enlarge your photo to take a closer look. The overall appearance, to me, is simple and classic. Nice quilt! I love your quilt. The space you got, from the white strips in the sashing is great! It makes the clovers really stand out nicely. Very nice setting – your decisions make it really nice. pretty!! 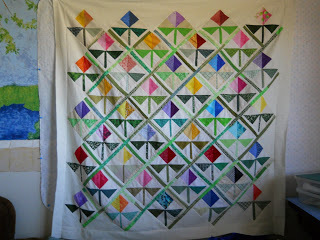 Love the clover quilt – you must be so excited to be close to finished. What a beautiful clover quilt! Nice job!! And great fabric combinations for the batik rails.